This post was sponsored by Dignity Health-GoHealth Urgent Care as part of an Influencer Activation for Influence Central and all opinions expressed in my post are my own. If you know me personally you probably know that I am very interested in understanding how the American Healthcare system works as well as sharing what I know. Thus, I jumped at the chance to visit Dignity Health-GoHealth Urgent Care for a tour as a part of a promotional campaign. It is not often that you get a chance to visit a medical facility and just ask questions when none you know is sick or injured. The location I visited is Dignity Health’s Castro center, (2288 Market St, San Francisco). 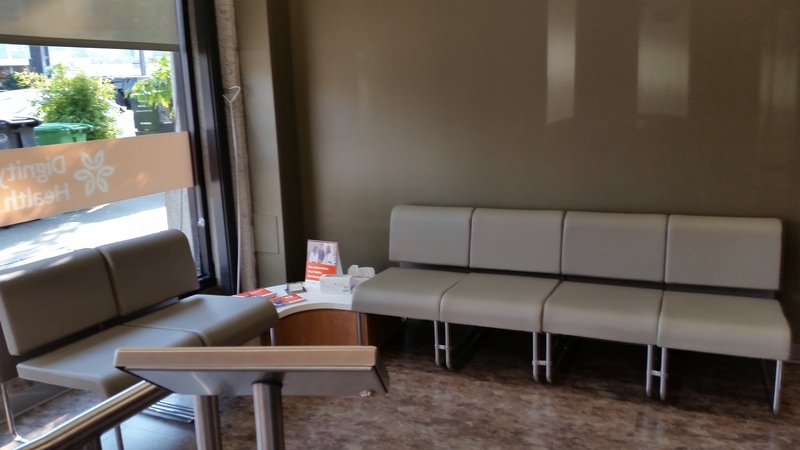 This is just one of Dignity Health-GoHealth Urgent Care’s 10 facilities. Seven are in San Francisco, with the other three in Daly City, San Bruno, and Redwood City. As soon as I arrived at the Dignity Health-GoHealth Urgent Care Castro facility, I noticed something shocking. There were no patients waiting in the lobby. I have been to my share of urgent care centers and emergency rooms and these places are always packed with people. With emergency rooms, people suffering from non-life-threatening emergencies often wait hours to see a doctor. This just wasn’t the case with Dignity Health-GoHealth Urgent Care. As it turns out, there were people waiting. But, in a very high-tech way. Patients can easily check-in online and come for a short-term appointment when it is time for you. As I am writing right now, on December,14 2017 at around lunchtime; they have availability in all their urgent care centers within next 20 minutes. The wait is not long, it is just well organized so as to avoid having people sitting in the lobby sneezing on other patients. The Dignity Health-GoHealth Urgent Care website shows the wait time if you do want to walk-in and you can even check-in online, too. So, even the check-in line is made obsolete by technology. Go ahead, look for yourself https://www.gohealthuc.com/bayarea. You won’t be surprised at all that Dignity Health-GoHealth Urgent Care is featured on lists of the fastest growing urgent care centers in the SF Bay Area. I came to the USA a little over a decade ago and one of the most difficult things for me to understand about living here was how the US health system works. At first, I felt that I was just missing some context. But, now I realize that even people who are born and raised in the USA do not know how to navigate the US healthcare system. Getting a result that makes you feel better and does not cost a fortune in money or an eternity in time is pretty rare. Urgent Care is a service that often meets these requirements. But, I have met so many people who do not even know how Urgent Care works or how it is different from other types of medical visits. One of the things I asked questions about during the tour was how people should decide when to go to Urgent care and when to use other services. It is often hard for non-doctors like myself to know what the right answer is for medical care. If you wait for a doctor’s appointment, your problem could get worse. But, if you go to the ER, you might end up waiting in a lobby while people with real emergencies are treated and then get a humongous bill for emergency services that were overkill for your problem. Dignity Health-GoHealth Urgent Care gave me a lot of information on this. Here is what they suggested. You can go to an Urgent Clinic, when you are unable to see your regular doctor and need to be seen the same day. Sometimes this happens because you need medical attention after hours, weekends, holidays. But, sometimes your doctor just has too many appointments to see you right away. You can also go to urgent care for many things that you would go to an Emergency Department for. Broken bones, bumps, bruises, strains, sprains, minor-burns, or even infections. If your injury would be described as a major trauma or life-threatening or otherwise an “emergency” you should go to the ER. That is what they are there for and, in these cases, you should be seen quickly. 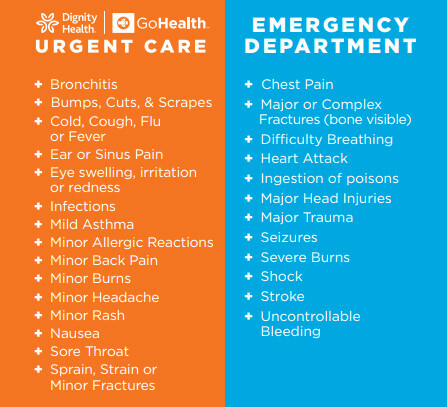 Here is a printout Dignity Health-GoHealth Urgent Care provided to me that will help you to learn when you can go to urgent care and when you should go to the ER. Obviously, you could err on the side of caution and go to the ER for everything. But, there are some real drawbacks to this. In addition to the waiting while more serious cases are handled, the financial impact for an ER-visit is significant. Even treatment for everyday issues like the flu or headache in an ER can cost big bucks for you and your insurance company. But, at an Urgent Care clinic, even the rate for uninsured individuals is affordable by healthcare standards. Finally, if you live in SF Bay Area, I recommend you try one of the Dignity Health-GoHealth Urgent Care locations. As I have said the benefits of introducing this kind of care into the options you choose from are manifest. But, Dignity Health-GoHealth Urgent Care, in particular, is doing a first-class job of integrating modern technology with a personal community-tailored approach to medical care. Dignity Health-GoHealth Urgent Care locations are open year-round from 8am to 8pm on weekdays and 9am to 5pm on the weekends. But, you don’t need to memorize schedules. You should just visit their pretty-cool website to pick a time/place that works best for you. 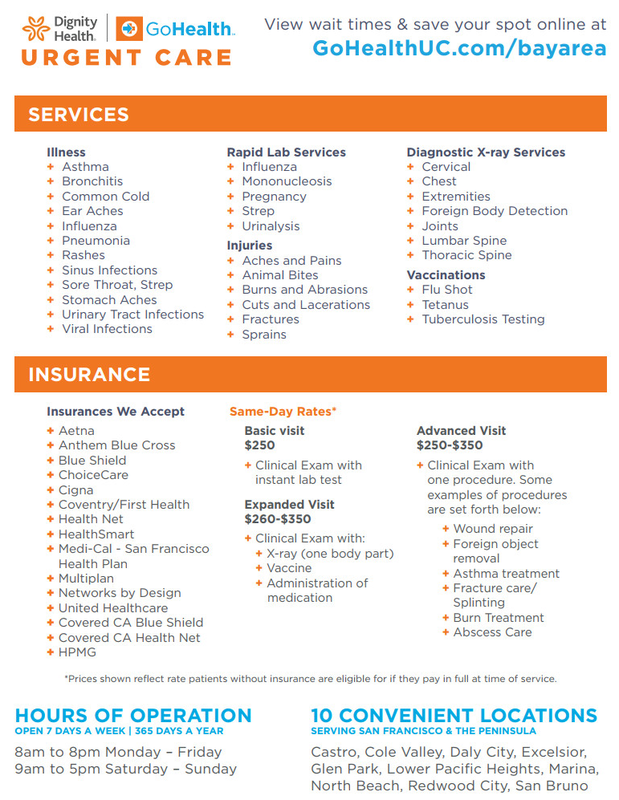 Dignity Health-GoHealth Urgent Care accepts various insurance plans (see the image below), they even accept Medi-Cal San Francisco Health Plan. Their non-insurance rates are between $250-$350 although services (like their $25 flu-shots) are cheaper. They accept patients over the age of 6 months and have the facilities (x-ray machine, lab, etc.) you would expect from a neighborhood medical facility. Here is a brochure to help you determine if your insurance provider is accepted at Dignity Health-GoHealth Urgent Care.